Carmel residents have a new option for pediatric otolaryngology care. Dr. D.J. Trigg opened Kids ENT of Indiana, 11590 North Meridian St. Suite 300, this summer. He previously worked at Peyton Manning Children’s Hospital at St. Vincent Indianapolis but wanted more control over his business. “I thought, ‘I can do this. I could be my own boss and run a tight ship,’” Trigg said. Trigg is the only doctor at the practice and has a staff of two. 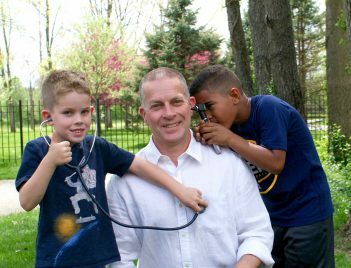 Trigg, a Carmel resident, handles a wide variety of ear, nose and throat issues in children. “I see a lot of different things. Treatments range from ear infections, sinusitis, nasal congestion, tongue tie and sleep apnea to really complex things like vascular malformations, neck masses and craniofacial abnormalities,” Trigg said. Trigg said doctors shouldn’t apply the same techniques to children as adults.